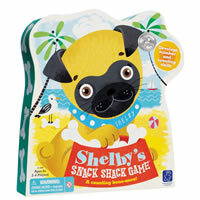 Watch your kids join in the excitement of this simple children's game called Shelby's Snack Shack. Kids will have to use the shelby squeezer to collect the most bones with their bowl. See below and read the official game rules and instructions to learn more about the fun twists this game has to offer. Shelby's Snack Shack has won a bunch of awards and is loved by both parents and kids alike. Designed to be fun and educational, your kids will love playing this game with their friends or siblings. See what all the fuss is about and play this fun-bone finding game with your kids today. Collect the most bones in your bowl by the end of the game and you'll be the winner. Inside the box is a game board, 1 shelby squeezer, 40 bones, 4 bowls, a double game spinner and the official Shelby's Snack Shack game rules and instructions. Please keep in mind that the official Shelby's Snack Shack childrens rules and instructions could be different depending on the game version you have. The rules below are some of the exact directions on how to play Shelby's Snack Shack. Share with us your comments, funny stories, tips, advice, strategies, creative ways to play, questions about how to play, problems with the rules or anything you want about Shelby's Snack Shack. All submissions will be reviewed within 24 hours. Click here to add your Shelby's Snack Shack comments.